INNER TOOB: LINKIN' CASE: "FRINGE" & "TWIN PEAKS"
LINKIN' CASE: "FRINGE" & "TWIN PEAKS"
January isn't even over and yet we already have a slew of new crossovers for Toobworld. Before the month is over, we'll even have what I guarantee to be the Crossover of the Year! 'Fringe' returned to the airwaves* on Friday night with the episode "The Firefly". At one point, Dr. Walter Bishop was sporting custom-made, wire-framed 3D glasses. When Astrid commented on them, Walter said that they were a gift from his friend Dr. Jacoby, who was in Washington state. 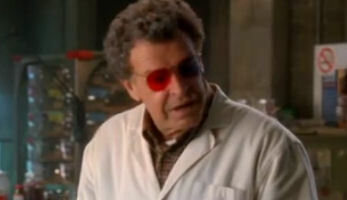 Dr. Lawrence Jacoby was a character in the 1990 cult hit 'Twin Peaks', a town situated in Washington. 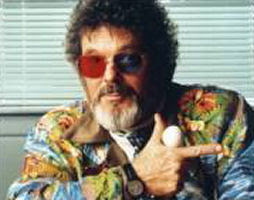 And Dr. Jacoby was known to wear such eyewear during the course of the series. Walter and Jacoby may not have been classmates in college - there's about a decade's difference in their ages. But they could have been colleagues in research (at least before Walter ended up in St. Claire's.) There's no age limit in that - after all, Dr. William Bell was over a decade older than Walter as well. It's always possible that Walter's "son" Peter was on his way to visit Dr. Jacoby (perhaps an old family friend as well as Walter's research associate) in the state of Washington when he became entangled in the events of the episode "Northwest Passage". 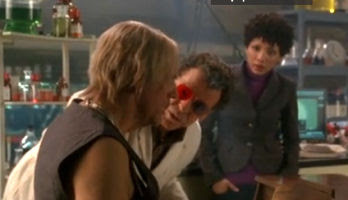 'Fringe' has made connections to 'The X-Files' and to 'Lost' in the past, both of which can link to many other TV series. So this would bring 'Twin Peaks' into the fold and that's a big get. There have been more obscure references to the off-beat classic in the past, but shots of swinging traffic lights, damn good coffee & cherry pie, and eery Badalamente-style music aren't enough to declare a connection to the 1990 cult classic. And for shows like 'The Chronicle', 'Beverly Hills 90210', and 'The Fresh Prince Of Bel-Air', it was just a TV show anyway. The show that came the closest to making a theoretical connection would be 'Northern Exposure'. In the episode "Russian Flu", Holling took Joel and his fiancee to the waterfalls of Cicely, Alaska, (which suspiciously looked like the waterfalls in Twin Peaks, Washington), and there they saw a woman who looked a lot like the Log Lady from the other show. Okay, so we never actually got to see the Log Lady. But I'm willing to accept that it was Margaret Lanterman anyway, seen from a distance. Now, the filming locations for both shows were near each other, but in the reality of Toobworld, there's quite a distance between Twin Peaks and Cicely. Easily splainable - Ms. Lanterman was on vacation up in Alaska. Having Walter actually be friends with a character from 'Twin Peaks' is quite a prize for Toobworld Central. It's a moment to be treasured....... Too bad it can't be wrapped in plastic. Awesome! I passed this on to my fellow Wolder, Henry Covert, who discovered the links listed in Crossovers Vol. 2 that bring TP into the WNU. BTW, the Psych episode did have what could be interpreted as a solid connection to the series: at the beginning, Shawn tells Gus that he just read online that a woman in Washington invented noiseless drape runners in the early '90s, a clear reference to Nadine Hurley. Lawrence seems to be a pretty cool guy, so I'm gonna go with the General Hospital Jacoby being his evil twin (literally). THE NTAs = NATURAL TEMPORAL ANOMALIES? LINKIN' HAZE: AN IRONCLAD SPLAININ? SKED ALERT: "GAME OF THRONES"
THE FRIENDS & FAMILY OF "TREK"